ownCloud supports “federated sharing”, which essentially means connecting an ownCloud server with other ownCloud servers to enable sharing between them. 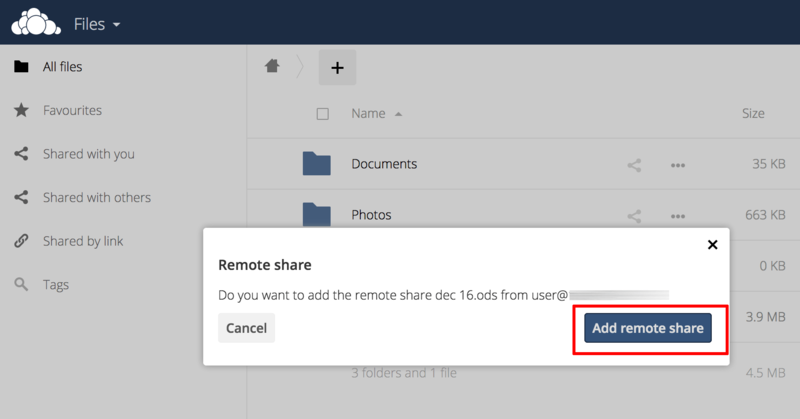 Federated sharing is enabled by default in ownCloud 9 and better. NOTE: Federated sharing requires all involved ownCloud servers to be public, so that they can communicate with each other. Log in to your ownCloud server. Use the “Files -> All files” menu item to find the file you wish to share. Click the “Share” icon next to the filename. In the “Sharing” side panel, tick the “Share link” checkbox and copy the resulting URL. Send this URL to the user you wish to share the file with. Browse to the share URL. On the resulting page, click the “Add to your ownCloud” button and enter the URL of the destination ownCloud server (the server the file should be shared with). The source ownCloud server will attempt to connect to the destination ownCloud server and share the selected file. The recipient may need to log in to the destination ownCloud server and confirm the share operation as part of the process. If successful, the remote user will be able to see the shared file under the “Files -> Shared with you” menu item on the remote ownCloud server. The share can be undone at any time by unchecking the “Share link” checkbox under the file’s “Sharing” side panel on the source ownCloud server.